Another low Flevo-racer, but this one has a 406 front wheel. The head tube angle in this bike has been tilted in such a way that it has a positive trail. This steering head angle has a disadvantage that the bike cannot make sharp corners, but it is much safer at high speeds. 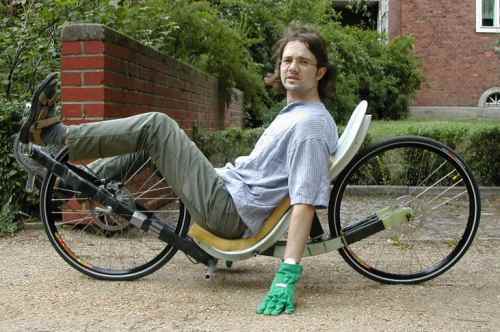 A low Flevo-racer with two 406 wheels, high handlebars and an even more recumbent riding position. Maybe in the future, a cantilever steer will be placed. The head tube angle is 45°; the trail 6 cm. The maker writes that it tends to steer somewhat nervously at low speeds, but at cruising speeds (around 35 km/h) it rides really good. 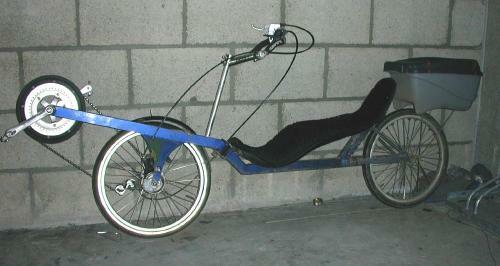 A lowracer that resembles the above bike, but with under seat steer and rear suspension. The name 'Laura' is inspired by the sound resemblance with 'lowracer'. Oliver Schauer has learned much from his first Flevo-lowracer Laura, and this is his new racer. A Lowracer that is inspired by the FlevoRacer. As compared to the other lowracers, the steering head is placed relatively high (and upside down). Later, the front tube has been bent more downward. This has improved the riding stability quite much. The riding behavior is excellent, and the owner remarks especially the enormous front wheel pressure. Slipping while riding away is impossible. A disadvantage is the fact that it is completely unsprung, so that sometimes it shakes your bones unpleasantly. The Python is Jürgen Mages' pivot steered lowracer. 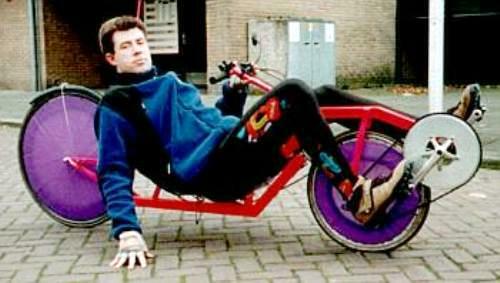 After cycling on the Airbike since 1996 he wanted to have something faster and lower. For the bike on this photo he needed not more than 10 € for the material because it's mainly built from recycled bicycle parts. The Moontraveler is the first carbon-version of the Python. 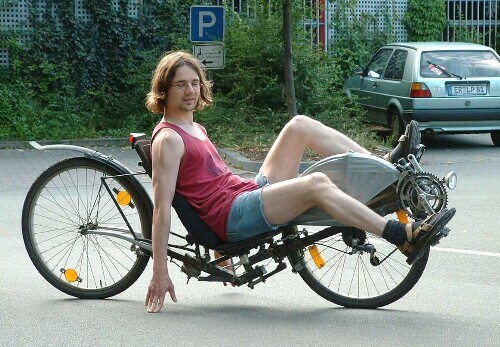 Stefan Knorr is going to build another bike when all possible problems are solved.